Many couples tying the knot these days are not only looking for different kinds of ceremonies and receptions, but unique and memorable locations as well. More and more weddings are veering away from the traditional ceremony and reception, and instead heading toward what is known as the “Destination Wedding”. Typically these types of weddings result in smaller numbers of people attending, but allow for couples’ friends and families to experience an unbelievable day to remember. New York City is arguably the most iconic city in America, so why not select a weekend afternoon in the ‘The City That Never Sleeps’ to exchange wedding vows? 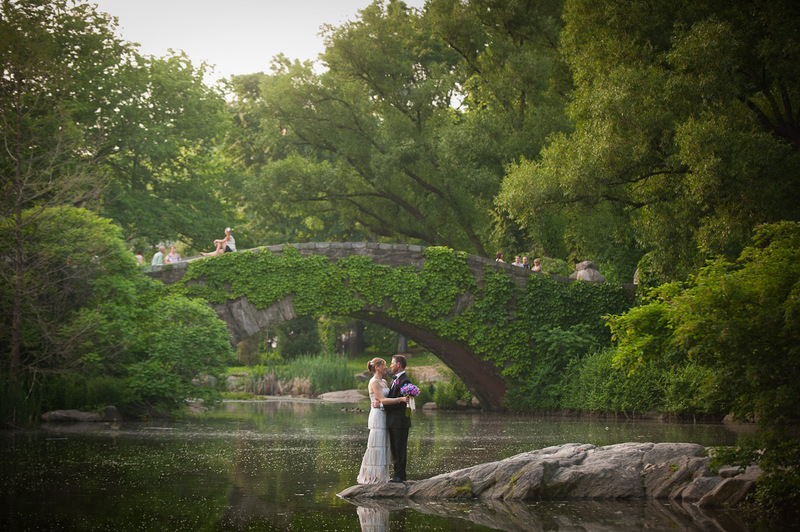 Though the venues in NYC are seemingly endless, perhaps Central Park is the most ideal location for a wedding. Nestled between the busy city avenues and skyscrapers, sits the tranquil beauty of this green-filled park. With nearly a dozen locations available throughout the park, the Conservatory Garden, the Pond, and the Boathouse are three annual favorites for weddings. It should also be noted that the famous Tavern on the Green is currently under renovation and inquiries about its expected time of re-opening should be checked on a regular basis. It’s important to know that there are fees, applications, and certain restrictions that go along with having a wedding in Central Park; for example No alcohol, amplified music, or tents are permitted in the park. For more information and to download an application visit the NYC Dept. of Parks & Recreation’s website at www.nycgovparks.org/. Getting married in a mall? Yes, believe it or not, America’s largest mall plays host to hundreds of weddings a year, having had more than 5,000 performed since its opening. With over 4-million square feet of building area, 520+ stores, and a twenty-five ride and attraction amusement park built inside, it’s no wonder that more than 40-million people visit the MOA every year. But a wedding, really? 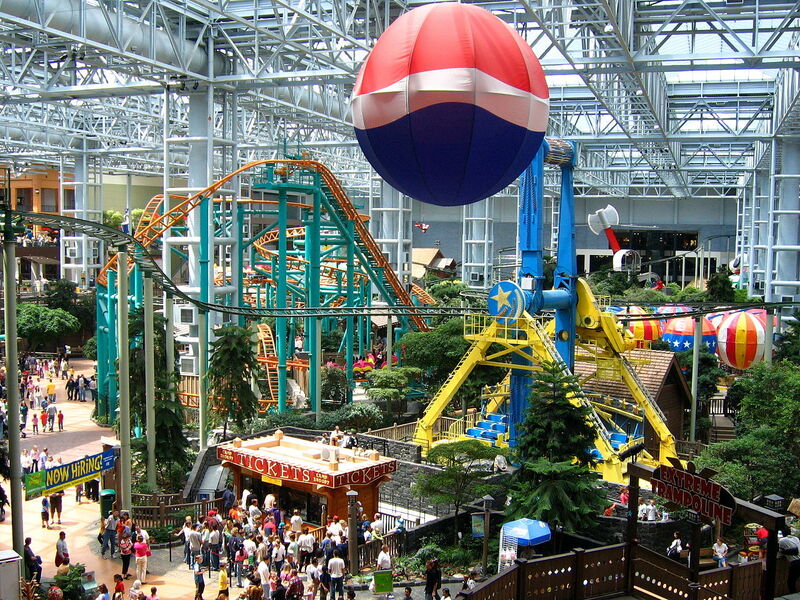 The fact is the Mall of America has several venues to accommodate just about any style and budget. The MOA even has… (Move over Elvis…) The Chapel of Love! Catering to those who can’t get enough of ‘retail America’, the chapel has photographers, hairstyling, dresses and tuxes, and more all at your disposal. And they of course take all major credit cards. Find out how to book your nuptials by visiting www.MallOfAmerica.com . For a more rustic approach to tying the knot many couples are venturing to one of the country’s great natural wonders, the Grand Canyon. Some of the more popular ways to celebrate the big day in that area is to be helicoptered in and dropped off onto the peak of a mesa, or ride the historic Grand Canyon Railway from Williams, Arizona that winds through the magnificent canyon with all its colors and beauty. The helicopter rides range in price as well as duration. Bridal parties can view the Hoover Dam and Las Vegas from high above, as well as take in remarkable sunsets as they come and go from the majestic Grand Canyon. 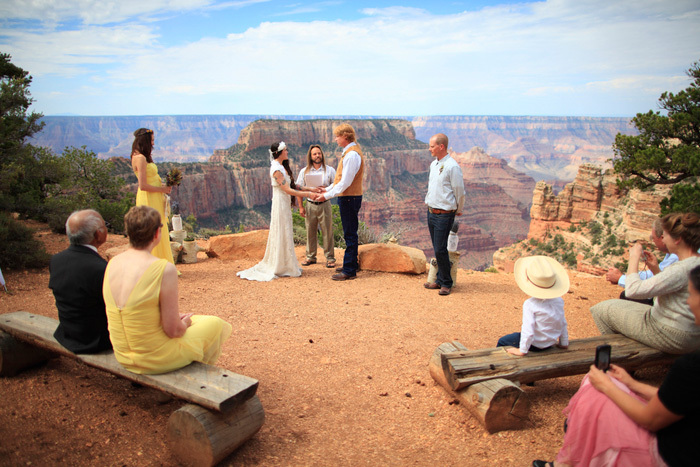 Staying more down to earth, the Grand Canyon Railway excursions offer a slower pace, yet still a memorable wedding day. Bridal parties can reserve their own 1923 rail car or mingle in with other passengers. Full-service wedding packages are available and an outdoor wedding permit is required by the National Park Service by calling (928) 638-7841. Dotted along the Pacific coast sits some absolutely incredible venues for a one-of-a-kind wedding. Carmel and Monterey, California offer breathtaking backdrops for a bride and groom’s magical day. From Monterey’s rocky cliffs to Carmel’s soft sandy beaches, this region gives couples a variety of spectacular venues to choose from. From Stewart’s Cove to Carmel Beach, and Cypress Point at Pebble Beach to the Monterey Stone Chapel in the Redwoods, this area of the Pacific Coast region is home to hundreds of “I Do’s” each year. Booking reservations at a specific area requires timely planning and flexibility of venues and dates, so couples are encouraged to make their plans as soon as possible. 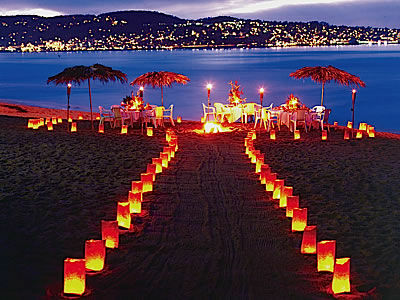 www.MontereyWeddings.com is a great place to view all that is offered for weddings in the region. It’s widely known that for skiing enthusiasts there perhaps is no better place to be from mid-autumn to late-spring than the ski trails of Colorado. So it only seems natural that for those who happen to be planning a wedding and enjoy fresh Rocky Mountain powder Colorado is a perfect destination for them. 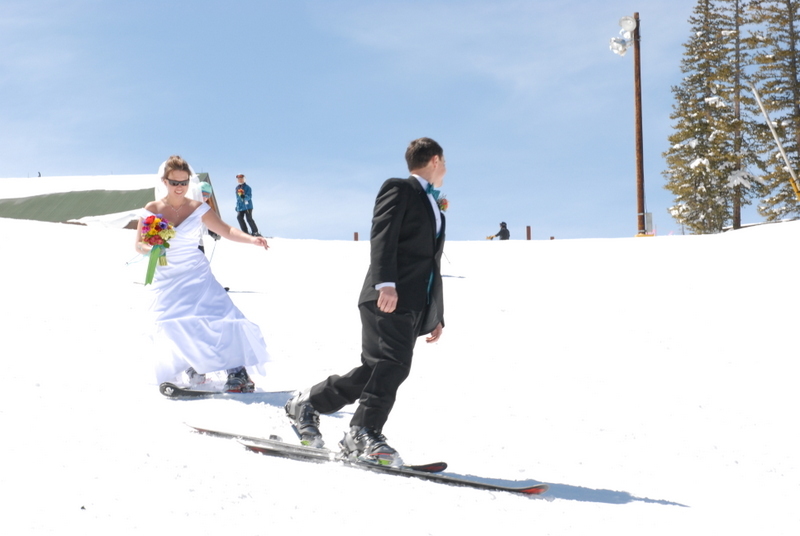 Of course the summer months in the Rockies are also ideal for a memorable wedding. Perhaps the most popular location in the region is Aspen. With an array of hotels, restaurants and activities, Aspen is built for special events. Other Rocky Mountain venues that are perfect for weddings are Golden, Denver, Breckenridge, and Vail, Colorado. Whether winter, spring, summer, or fall, the Rockies offer fun, adventure, and endless memories for brides, grooms, and their families and friends. Finding a location and time of year to suit the soon-to-be-newlyweds in the Rocky Mountain region will take some research and maybe even a couple “fieldtrips”. A great online resource to get your magical day planned is appropriately titled www.RockyMountainBride.com . Like Muhammad Ali knew boxing, the Beatles knew rock n’ roll, and Michael Jordan knows sneakers; with fifteen locations situated around Paradise Island, Atlantis knows weddings. Whether it’s a sunrise or sunset ceremony, a flower-filled or sandy beach backdrop, or a reception for twelve or five hundred, Atlantis at Paradise Island has it covered. From barefoot casual to over-the-top elegant the possibilities are endless for one’s storybook wedding. With the serenity of the Caribbean rippling in the background couples can exchange vows at the secluded Cove Beach. For those looking for a little more ‘wow-factor’ in their ceremony and reception a reservation at Ripples may be just the ticket. Surrounded by a Mayan-style décor and breathtaking water features, a wedding at Ripples will have guests talking about it for years to come. A complete guide to weddings on Paradise Island can be found at www.Atlantis.com . 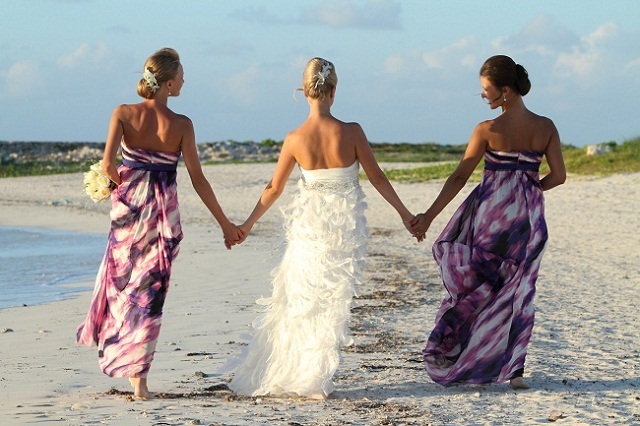 Here visitors will be reminded of what to ask and what to expect when planning a destination wedding in the Bahamas. And remember, U.S. citizens are required to have a passport in order to return to the U.S. (which when you think of it, may be a great place to get stuck for awhile). For generations Disney World in Central Florida has been thought as a childhood destination. But today the land of Mickey is playing host to nearly two-thousand Cinderella-like weddings each year. Though Disney offers dozens of places to hold a ceremony and reception, I think the most unique venues can be found at a place that may not come to mind right of the bat– the Epcot amusement park. Epcot’s World Showcase takes visitors on a trip around the world, with an incredible attention to detail paid to each country’s highlights. It is here that a bride and groom can choose to be married alongside an English countryside, next to a cascading Canadian waterfall, or with a replica of Rome’s Trevi fountain set as their backdrop. From flowers to cakes, and ceremony to fireworks-filled reception, the wedding planners at Epcot will be there to assist the happy couple every step of the way. 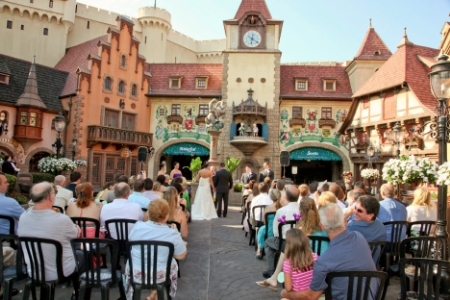 Wedding venues at Epcot’s World Showcase can be found within the countries of Canada, United Kingdom, France, Italy, China, Germany, Japan, and Morocco. To start making plans for your Epcot destination wedding visit www.disneyweddings.com . There are sports fans across the country that would go to the ends of the earth for their favorite team or player. Perhaps there is no place in America where this is truer than in the city of Boston, where fans do just about anything for their beloved baseball Redsox. Having been crowned World Series champions three-times over the past decade, there is no hotter ticket in sports today than that with the Boston Redsox logo attached to it. With all of that in mind, many fanatic couples try to make the Redsox part of their wedding day in any way possible. Whether they decorate their reception hall with red and blue flowers, or have their bridal party decked out in home and away uniforms, some fans just want their favorite team part of their big day. On the other hand, more and more couples are taking their fanaticism to a whole new level; “upper deck level” that is. 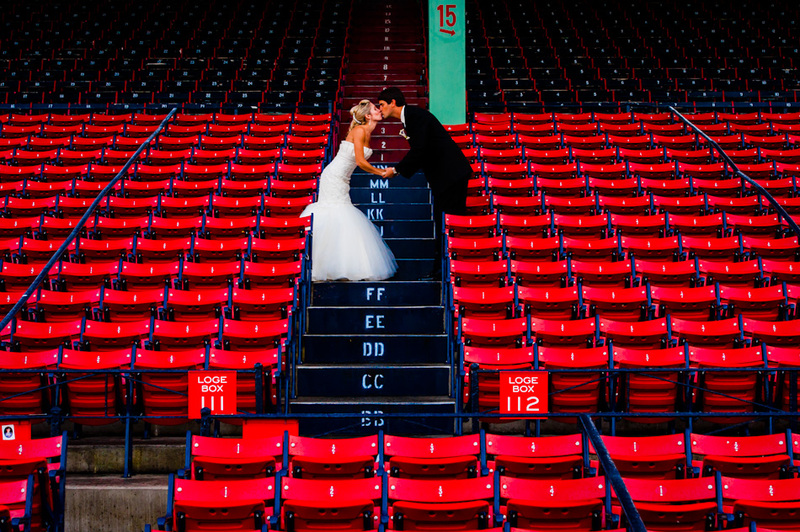 The Boston Redsox, like many other sports franchises across the country, are now catering to their over-the-top fans by opening sections of the stadium for wedding ceremonies and receptions before, during, and after the game. Fenway Park’s history and charm can now be captured on sunny afternoon or starlit night during a Redsox home-stand or even while the stadium is vacant. Brides can say their vows from the famed Green Monster, or overlooking homeplate from the EMC Club, which seats up to 300 guests. So warm up your vocal chords for a rousing rendition of “Sweet Caroline” and contact the management of Fenway Park at www.Redsox.com to book your upcoming wedding. So from a ballpark to a mall, or an island to a mountain top, the U.S. has some amazing venues for those couples looking to create a once-in-a-lifetime wedding memory. Where will your dream wedding be?